"Our intention is, that Timaeus, who is the most of an astronomer amongst us, and has made the nature of the universe his special study, should speak first, beginning with the generation of the world and going down to the creation of man..."
'Timaeus' is usually regarded as one of Plato's later dialogues, and provides an account of the creation of the universe, with physical, metaphysical and ethical dimensions, which had great influence over philosophers for centuries following. It attributes the order and beauty of the universe to a benevolent demiurge - a 'craftsman' or god - fashioning the physical world after the pattern of an ideal, eternal one. The dramatic setting of the dialogue is the day after a discussion in which Socrates has described his ideal state - as in the 'Republic'. 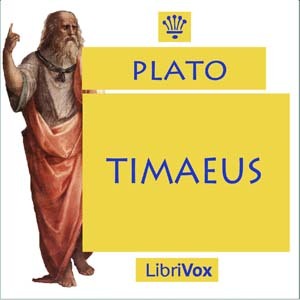 A conversation between Socrates, Critias, Hermocrates and Timaeus, including Critias' account of Solon's journey to Egypt (where he hears the story of Atlantis), soon gives way to the monologue by Timaeus that forms the bulk of the work. 'Timaeus' is translated by Benjamin Jowett and his comprehensive introduction to and analysis of the work precedes the text itself, which he describes as "the growth of an age in which philosophy is not wholly separated from poetry and mythology".